The FD400 GT terminal is light and ergonomically shaped for true mobility and flexibility. The FD400 GT terminal is light and ergonomically shaped for true mobility and flexibility.It utilizes 3G technologies to connect wirelessly over Sprint and Verizon CDMA. Which means you'll be getting the fastest data transmissions and more coverage area for your business. The multi-application platform supports a full range of payment and value-added services. 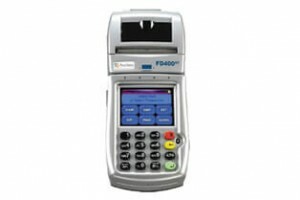 It provides fast, efficient downloads while meeting MasterCard POS Terminal Security (PTS) requirements. This terminal communicates off the Sprint and Verizon CDMA Network.